American actor, Robert Downey Jr. has been active in his career since the age of five. At that time, he appeared in one of his father’s movies. He was nominated for the award of Best Supporting Actor for the role of Charlie Chaplin in 1992. Downey developed a serious drug problem in the 80s that plagued him until 2001 before he was able to get completely sober. He played in several movies in supporting roles until 2007, when he was cast as Tony Stark in the movie Iron Man. Throughout the years, Robert Downey Jr. Hairstyles have changed considerably. He was photographed wearing his hair at a medium length and styled to take advantage of his natural waves. In addition, he was wearing a mustache and beard. The idea was to adopt a softer, more sensual look. Today, he still has the medium length hair, but the style is different. This style features full tapered sides and jagged cut on the top. The crown is cut fairly short with a few locks left longer for texture. Styling the hair into this style is simply a matter of running the fingers through the hair. If one desires a bit of hold in the hair, shaping gel or mousse applied while the hair is damp will hold it in place and give a rakish, funky look with minimum fuss. He has worn this style with his natural hair color and with the hair dyed to nearly blond. With the blonde do, he allowed his mustache and beard to grow out to about a sixteenth of an inch. This changed his appearance completely from the clean shaven brown haired Downey without changing the hair cut or style in any other way. 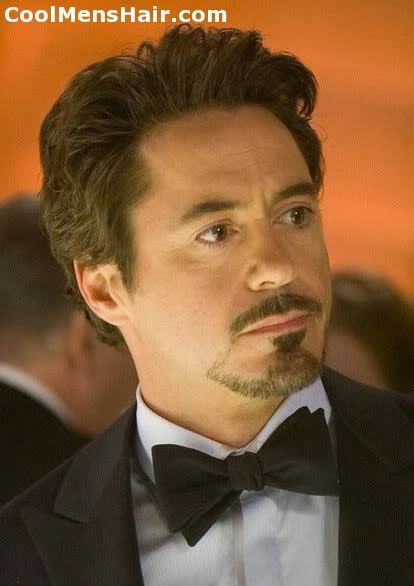 I think i prefer the blonde Robert Downey Jnr. Robert Downey Jr is one of my favorite actors. He has enough hair and a nice face to wear it long. I don’t say this often, but Robert is a hot guy, especially for his age. I’m not gay, bisexual, or have any sexual attraction towards men, but I can tell if a dude is hot.